Having now successfully uploaded A Snag in the Tapestry to Amazon and Barnes & Noble, I can recommend Scrivener without reservation. My knowledge of HTML is extremely limited, and my experience with HTML is pretty much just making italics and hyperlinks in blog comments. I’m not kidding when I say Scrivener probably saved me from a psychotic episode. Before I downloaded Scrivener, I read several tutorials on using it to create MOBI and ePub files. Each of them was a little different. My method ended up being a little different, too, so I figured I’d add it to the internet. I’d written the original manuscript for A Snag in the Tapestry in MS Word. When I publish chapters to the Thalia’s Musings website, I copy and paste them from the Word document and do a final edit in WordPress. What goes on the website always ends up being a little different than what’s saved on my hard drive. So for the ebook, instead of using my original manuscript, I created a new Word document and copied and pasted each chapter from the WordPress dashboard. I set this new document to 12 point Times New Roman font, full justification, normal spacing. I labeled each chapter with number and title. 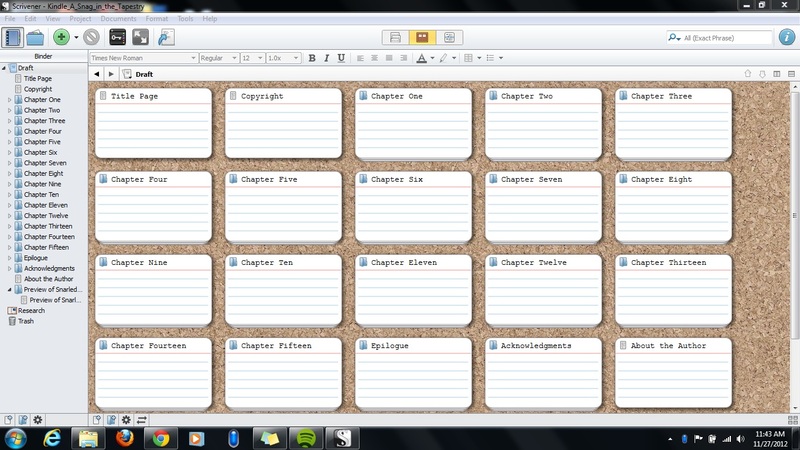 This was just for search purposes since I’d end up formatting the chapter headers in Scrivener. I made them 18 point, bold, with two spaces between the header and the first line. The grey bar on the left is the binder. The main part of the screen that looks like a corkboard is Corkboard. Corkboard is where I put my folders in the order I wanted. Every time I added a new folder or page to the draft, Scrivener would automatically put it at the top. I’d go to Corkboard and drag it where I wanted it. See the green button with the plus sign? That’s what you click to add a new folder or page to the draft. The dropdown menu lets you select Page or Folder. I put my chapters, acknowledgments page, and preview for the next book in folders. I put my title page, copyright page, and author bio in pages. I didn’t create a Table of Contents page. Scrivener will do that for you, complete with hyperlinks, when you compile your ebook files. See the icon at the far right? The white page with the blue arrow? That’s Compile, the magic button that turns your draft into an ebook. If you’re making two different ebook files (like MOBI and ePub), you’ll want to do a Save As before you click Compile. I created two appropriately-titled identical documents at this point. I edited the Nook version so that the copyright page said Nook Edition and the author bio didn’t contain a hyperlink to the Thalia’s Musings website (Kindle allows hyperlinks, Nook doesn’t). So then I was ready to compile my ebook. I clicked Compile and selected either Kindle or epub. The menu walked me through the metadata (I love saying that word. Metadata. Metadata. Metadata.). On the Contents menu, I opted for a page break before each folder (chapter) and each page of “front” matter. I didn’t upload my cover image to the file since both Amazon and Barnes & Noble ask for it to be uploaded separately. I was able to preview my MOBI file in the Kindle app on my laptop. I never could get my ePub file to open in my Nook app, so I used Calibre to preview that. Disclaimer: It didn’t actually happen like this the first day I opened Scrivener. If you’re new to Scrivener and to ebook formatting, I recommend giving yourself at least a week before your release date to play around with the program. Plan on spending the first day going through Scrivener’s tutorial. Plan on compiling and previewing a few times before you get results you’re happy with. Do NOT skip the preview stage. You want to see what your book will look like in e-readers before you upload it to Amazon or Barnes & Noble. Any questions about my experience with Scrivener? Ask away! UPDATE: For more details about things like poetry/verse, footnotes, and Table of Contents, check out Part Two of my Scrivener adventures. All the major formatting work on A Snag in the Tapestry (Thalia’s Musings, Volume One) is done! The cover art should be done by the end of the week. Both the Kindle and Nook versions should be released on (Black) Friday, November 23 right on schedule. I’m reserving final judgment until my ebooks actually upload and go live to the Kindle and Nook stores, but at this point I fully expect to become one of the many indie authors singing the praises of Scrivener. After my ebooks are published and I’m sure what I did actually worked, I’ll write a post detailing how I did it. Based on the reviews I’ve read, every writer uses Scrivener a little differently. The common denominator is ZOMG EPUB AND MOBI FILES WITH ONE CLICK!!! Working on ebook creation is interesting when you are only vaguely familiar with HTML and have no experience in coding. I’m trying out a program called Scrivener that is supposed to take care of this problem for me. New software is always a challenge, but I’ve got to say, so far Scrivener is a lot easier on my brain than going through my whole manuscript line by line in Notepad would’ve been. If everything keeps going as well as it has the last couple of days, I should be able to give you an official release date for A Snag in the Tapestry by next Monday! BTW, for my readers who don’t own Kindles or Nooks, there are free apps that will let you read Kindle or Nook files on your computer. Amazon’s is here. Barnes and Noble’s is here. And since my ebooks will be published DRM-free, you should be able to read them in Calibre.